Chronic obstructive pulmonary disease (COPD) is an ongoing lung disease that makes it difficult to breathe. It’s also a disease that’s often misdiagnosed as asthma. Although most patients are correctly diagnosed by their doctors as having either asthma or COPD, up to 20% of patients with respiratory symptoms are difficult to accurately diagnose. Because differentiating between asthma and COPD is essential for determining the appropriate treatment, understanding what sets these two lung diseases apart may help you decide whether or not you should further discuss your diagnosis with your doctor, or seek a second opinion. Shortness of breath – the medical term for shortness of breath is known as dyspnea. Initially, people with COPD may not experience shortness of breath, or they may experience it only during moderate activity. In the advanced stages of the disease, shortness of breath may occur even while resting. Although dyspnea can be uncomfortable and frightening, avoiding activities that make you breathless will only lead to further deconditioning which may result in a worsening of shortness of breath. Medications such as inhaled bronchodilators or steroids, and staying physically active, and/or participating in a pulmonary rehabilitation program can help minimize the sensation of breathlessness. If shortness of breath becomes troublesome or increases, talk to your doctor about medication and/or a referral to pulmonary rehab. Cough – the primary cause of COPD is exposure to environmental irritants, particularly smoking. Coughing is the body’s way of protecting itself against airway irritants and/or ridding the lungs of excess mucus. A cough in COPD can be dry and hacking, or it can produce mucus. Treatment for cough includes over-the-counter cough suppressants, expectorants, and mucus-thinning medications, but can also include drinking plenty of fluids to help loosen mucus making it easier to cough up (as long as you don’t have a health condition that requires you to limit fluids). Unexplained cough, coughing that causes you to faint, or a cough that doesn’t go away with inhaler medications should be reported to your doctor. Excess mucus production – it’s natural for someone to have a cough when they have a cold, but excess mucus production is also a symptom of COPD. While some mucus production is necessary to lubricate the breathing passages, people with COPD often produce up to three times the normal amount of mucus. Because smoking and other airway irritants damage the cilia, (tiny hairs that help clear mucus out of the lungs), excess mucus pools in the breathing passages putting you at greater risk for infections such as bronchitis or pneumonia. If you’re troubled by excess mucus, talk to your doctor about being treated with expectorants and/or mucus-thinning medications. In some cases, you may even need antibiotics. Additionally, any changes in the amount, color, or consistency of mucus should be reported. Wheezing – in COPD, bronchoconstriction (spasms in the breathing passages), redness and swelling, or excess mucus can cause the breathing passages to narrow, resulting in a high-pitched whistling sound called wheezing. This is especially true if your lungs develop an infection. Wheezing can generally be controlled by medications, however, if it persists despite treatment, contact your doctor as soon as possible. Tiredness (also called fatigue) – fatigue is one of the most overlooked symptoms of COPD. Described as a feeling of loss of energy or stamina, fatigue may be annoying and uncomfortable, but is not considered dangerous. In COPD, feeling excessively tired greatly contributes to a decline in exercise or physical activity. Fatigue can be prevented or reduced by remaining physically active and learning how to conserve your energy during daily activities. Like breathlessness, taking your medications as prescribed and participating in regular physical activity or a pulmonary rehabilitation program can help minimize fatigue associated with COPD. Signs of worsening asthma are also important to recognize, and include asthma symptoms that are troublesome and more frequent, worsening shortness of breath, and the need to use a relief, or rescue, inhaler more frequently. How old was I when I got diagnosed? While asthma can occur at any age, the onset of COPD generally occurs sometime after 45 to 50 years of age. Approximately 80-90% of those diagnosed with COPD are current or former smokers. In contrast, many non-smokers get asthma. Do certain triggers make my symptoms worse? Stress, weather changes, environmental allergens and pollutants, even perfume, can trigger an asthma attack. For these patients, avoiding the trigger usually prevents the attack. In COPD, steering clear of airway irritants like tobacco smoke or air pollution does little to improve COPD symptoms. Do my symptoms disappear between attacks of worsening symptoms? 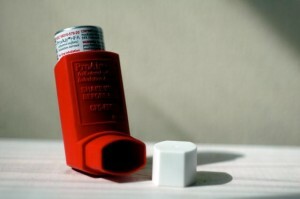 It’s normal for many people with asthma to be symptom-free between asthma attacks. It’s rare that people with COPD go a day without symptoms, even when they’re not having an exacerbation (attack of worsening symptoms). How is my lung function between exacerbations? Generally, appropriate treatment will completely reverse an asthma attack, returning lung function to normal. In contrast, medication is only partially effective at reversing the airway obstruction in COPD. After reading this article, we hope that you’re better prepared to discuss your respiratory symptoms with your doctor so that he or she can make an accurate diagnosis. Talk to your doctor today for more information about the difference between asthma and COPD. Miravittles, Mark, et. al. “Difficulties in differential diagnosis of COPD and asthma in primary care.” Br J Gen Pract. 2012 Feb; 62(595): e68–e75. Published online 2012 Jan 30. doi: 10.3399/bjgp12X625111 PMCID: PMC3268496. “What are the signs and symptoms of COPD?” American Thoracic Society. Accessed online February 25, 2015. “Asthma: Symptoms”. Mayo Clinic. Accessed online on February 25, 2015. Rodrigo Athanazio. “Airway disease: similarities and differences between asthma, COPD and bronchiectasis.” Clinics (Sao Paulo). 2012 Nov; 67(11): 1335–1343. doi: 10.6061/clinics/2012(11)19 PMCID: PMC3488995.